When working at Virtools, we had the opportunities to collaborate with the innovation team of P&G. In 2001, P&G was one of the first companies willing to replace the traditional physical store dedicated to market survey with virtual ones. The virtual views solution, that is still in use, allows creation of virtual packaging, store configuration and a virtual shopping experience into one of the many virtual reality centers of P&G — all around the world. I also worked with MasterFoods. Masterfoods was more focusing on the packaging design. 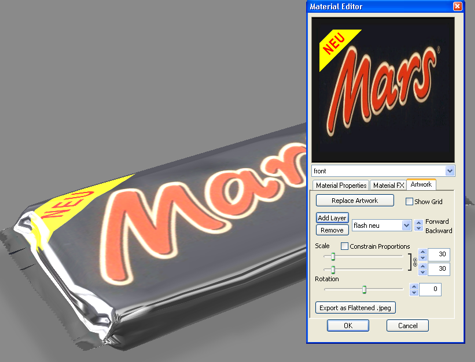 So we created a set of tools allowing easy variation of packagings with an intuitive interface. This way 3D illeterate people as marketing guys were able to iterate on packaging : changing shapes, colors and materials, adding promotional stickers. 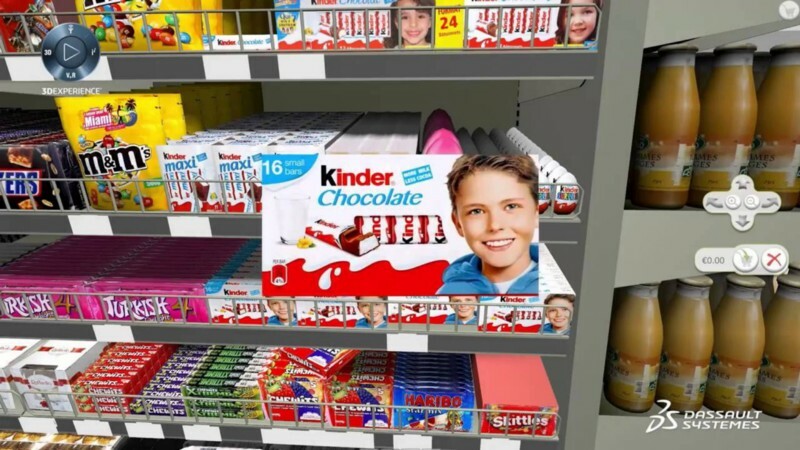 They were able to put the products in context of a complete shelf or store with a virtual immersion. This was en efficient way to use 3D interactive tool to express ideas in a more precise way — with non verbal expressions. Nowadays, using augmented reality is a logical extension of the contextual setup of products or points of sell. If those solutions were tailor made, today some software publishers as Dassault Systèmes have released on the shelf product as Perfect Shelf that are having the same of approach. 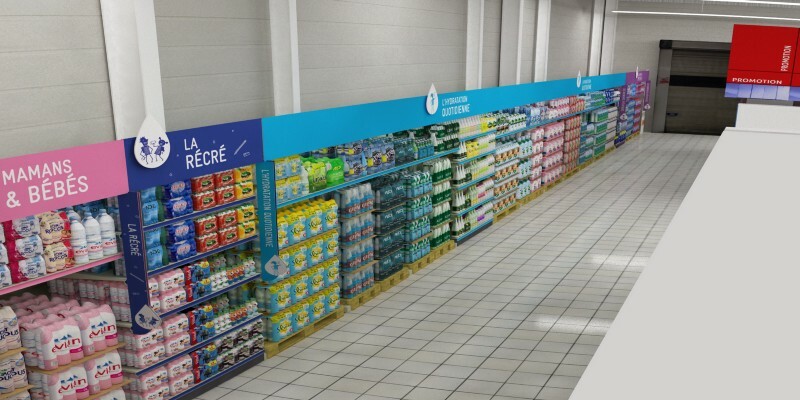 Today, Octarina is working on those different approaches including applications targeting sales forces : they are using virtual reality to showcase shelf configuration that can best highlight the product — as we have done for Danone. We also created a virtual reality experience to recreate the future of shopping with Atos innovation. First of all, as for any 3D interactive experience you have to create assets — nearly from scratch — as brands are not providing 3D models of their products. 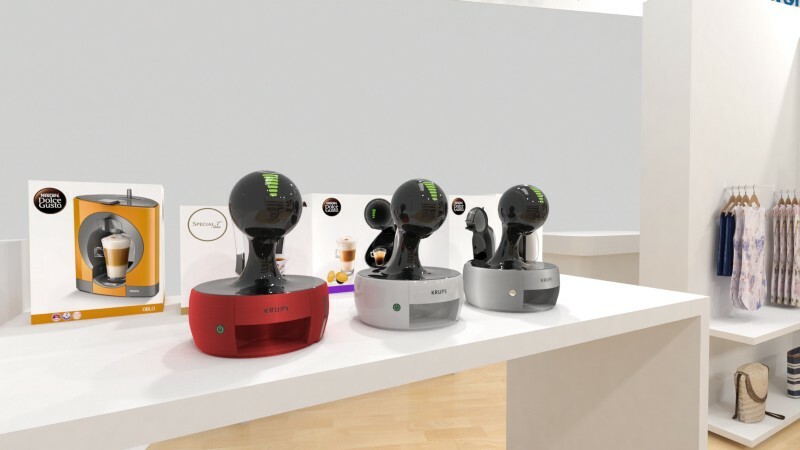 Despite the use of algorithms that can generate 3D objects when you only feed them with pictures of product, you may have to call for help 3D artists, specially when you need to reach high quality levels. For instance, it’s strongly required if you allow the virtual shopper to grab the product, and read small labels on it. Next, you have to be connected to existing shopping data. Meaning you have to develop specific connectors with planogram softwares (e.g JDA,…) that are well established tool. On top of this, you have to deal with real time displays of huge 3D data, and of course with the best VR ergonomics. So we have been talking about recreating virtual world to help marketing people to better understanding the impacts of product desigs and shelf/store configuration. But, today, the next step for retailer may be the V commerce : what about giving a real VR experience to consumers? And let them shop for real in a virtual world. I met a lot of people that wanted to create such experiences, but as far as i know, the results are some innovative and one of a kind experiences, mostly made for communication purposes. Or rebranding bad ideas as « VR revolution ». So what could be wrong whit this ? Sure : the VR devices are not yet mature for long and comfortable usage. But i believe nobody has found the right concept. Is the solution to create a virtual store as IRL the right one? I’m not sure, and you? Do you really want to be immerged in this painful reality? Virtual reality can be a great tool as it can make you feel things and let you go beyond the — sometimes- unpleasant reality. VR shopping has to give strong feelings to the consumers that will be for ever associated with brands.